A leisurely walk in Catherine Park is a gift to the soul. We came in as tourists for the afternoon, following a guide with long legs, so our steps were not so leisurely. Our guide had deadlines. They were not unreasonable, but he needed to keep us straight and timely, and there was no allowance for pokers like us. We could have spent hours here. On this bright autumn day, locals, mostly older people from the town of Pushkin, were enjoying the park, and maybe restoring their souls too, now that tourism was winding down. Some smiled as they waited for our small group to go by. Others, chatting with friends or dozing in the sun, barely noticed us. Like most parks around imperial palaces, there exists a yin and yang, the formal and the romantic, each designed by the greatest landscape architects Russian rubles could buy. Formal gardens with features borrowed from the French — box hedges, comforting symmetry, pleached lindens, and patterned plantings — are directly behind the palace, along with a baroque Hermitage, specially built for private entertaining. To the south lies the romantic landscaped park, wooded, with spacious lawns and manmade ponds and waterways, and a maze of paths that lead to delicious garden structures. Our eyes meandered through the tranquil scene reminiscent of English castle gardens we had visited, only grander. Grander because the park and palace cover 1400 acres and grander because Catherine the Great had seemingly infinite resources to create this romantic landscape. Paths and bridges led us toward tableaux of far-away structures, or brought us, gently, face to face with statuary and monuments. Sometimes these delectable antiquities would tease, half-hiding behind screens of rosy autumn leaves, or surprising us beyond a curve in a path. Our heads swiveled and our cameras clicked. Our imaginations sparked. Not with the usual oh, I could do this or that in my garden, for this park was far too palatial. Instead, we imagined Ralph Lauren’s lanky, flaxen-haired models with chic Russian fur hats parading single file along the Granite Terrace. The lay of the land brought back memories of picnicking and feeding pigeons in New York City’s Central Park. No pigeons or candy wrappers here; instead a glimpse of Frederick Law Olmstead’s future vision for Central Park, where rugged monoliths of basaltic bedrock and a zoo and cotton candy stand in for statuary and neo-classical structures. As for us, we watched plantsmen below at work in the formal gardens and wondered whether they worked all night, too, to manicure the park. At one end of the Gallery the Great Pond and its architectural flourishes were splendid in the afternoon sun. And then it was time to descend the massive staircase flanked by colossal bronze statues of Hercules and Flora, symbols of antiquity cast in statues of gods and men that were everywhere in this park. As we reluctantly took leave, we thought about the three generations of women who loved this park. The first Catherine, Peter the Great’s second wife, built a small stone house in the woods as a surprise gift to her husband. The tsar loved it. Their daughter, Empress Elizabeth, wanted razzle-dazzle. She commissioned the Italian architect Bartolomeo Rastrelli to create a baroque palace, a thousand feet long, longer than any other in Europe. 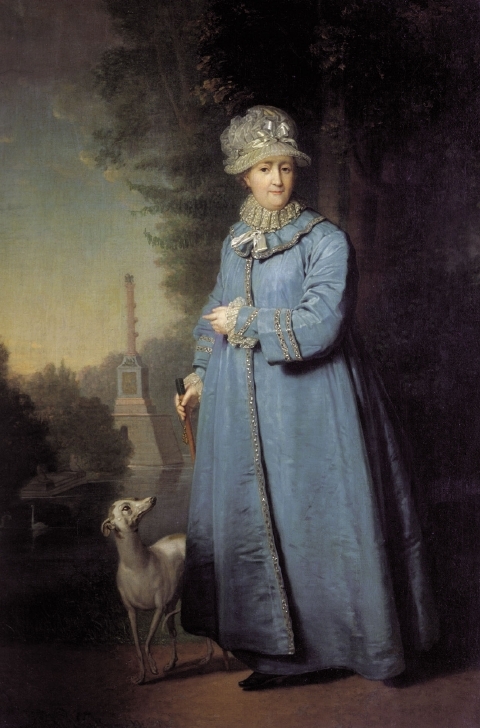 Catherine the Great, who sniffed that Rastrelli’s work was “whipped cream,” (by golly, it is) and who adored all things English, completed the vision of this summer palace and park just 12 miles south of St. Petersburg. What we are seeing is not the original. Nazis destroyed and burned the palace and park after the Battle of Stalingrad. With the aid of good records, the Russians were able to restore it accurately.